Anybody can create a website, but not everybody can create a conversion machine. Your website should be a mechanism in your business that allows you to convert prospective visitors into interested leads who will later become customers and advocates for the products and services that you sell. All website owners want this dream, but they typically fail to implement the correct measures that will allow them to streamline their conversion process, which will benefit their business in terms of sales, engagement, inquiries and referrals. My friends from Melbourne-based digital marketing agency Digital Next share their top 6 tactics that are guaranteed to improve a number of leads that you will receive from your website. Pitch your product or service to your niche market. Many people make the mistake of pitching one product or service to everybody. Even though it sounds good in theory, every person that visits your site has different motives, values, and desires. Whether the athlete male or female? The size of the athlete’s feet. The shape of the athlete’s feet. The running distance that the athlete needs to cover. The running style of the athlete. By tailoring your site to appeal to the different micro-niche audience, you will increase the conversion rate. The more granular you make it, the higher the conversions should be. Make sure your site has web pages that convert. Before you commit to a web design, it’s important to test out web pages to see which ones provide the best conversions. There are many websites that opt to build a professional website but fail to focus on the conversion elements. It’s important to test different design layouts to find the difference in conversions, site engagement, and bounce rate. Investing in this at the beginning can earn your business thousands or millions of dollars in revenue over the long-term. 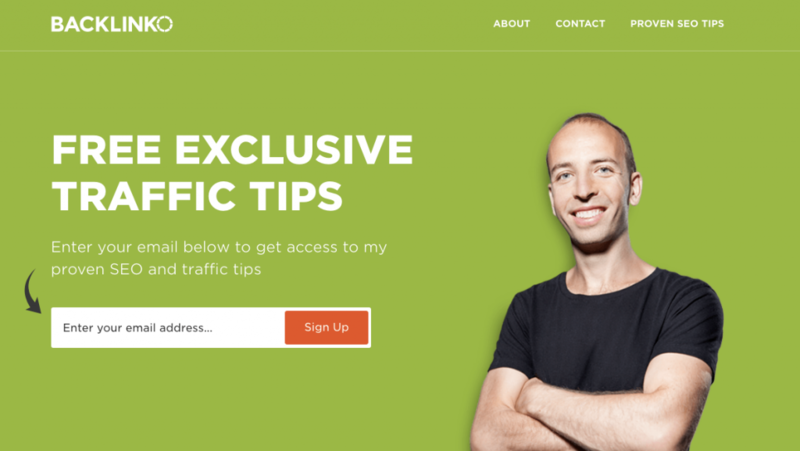 A good illustrative example is this landing page from Brian Dean’s site Backlinko. Make sure the web pages get to communicate your exact intentions. You want to inform and persuade visitors to your site so they will have the confidence to commit to the conversion. Before asking them for the sale or to submit an inquiry, the prospect needs to have enough trust in your business otherwise, their instincts will tell them to leave the website. Publishing a contact phone number for prospects to contact your business and speak to a representative who can answer any questions or queries that they might have. Publishing a compelling sales headline that addresses exactly what it is they are looking for. Publishing a high-resolution image that resonates with their current experience or the experience that they desire. Publish sales copy that informs and demonstrates value to the website visitor so that it will compel them to take action on the website. Use calls-to-action that tell them exactly what actions they need to take in order to get the outcome that they desire. Focus on getting people to register on your database network. This refers to getting qualified prospects to register their interest in your products or services by subscribing to your website’s email list or following your business on your social media networks. By getting them to register in your network, your business will be able to maintain communications with prospects and you can retarget them in the future so that they will gain more trust with your brand and commit to converting on your site in the future. For example, Videofruit using the above-the-fold part of the homepage to get website subscribers. Olivia Rose uses an ‘opt-in bribe’ to gain more subscribers to her email list. Use pop-ups to get more engagement. More often than not, people need a trigger that will make them convert. Pop-ups and welcome gates are great ways to increase the number of conversions on your website. Some of the leading pop-up software includes Opt-in Monster and SumoMe. 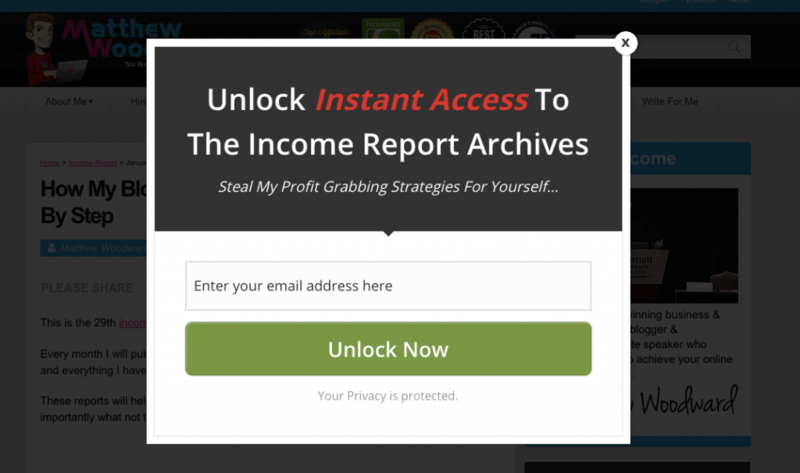 Example: Matthew Woodward uses the Opt-in Monster plugin to launch his pop-ups. Note: Google has said that they will be releasing an algorithm that will target interstitials. You will need to be cautious when using pop-ups on your site in 2017 and beyond. You can implement retargeting tags that will enable you to promote your site’s content, products or services offering across different ad networks. It’s easier and cheaper to retarget a visitor that has been on your site before than to promote and convert a brand new visitor. Simply add the retargeting code into your website, which will allow you to target previous visitors to your site and compel them to return so they will convert on your site in the future. What other people say about your business is more powerful than anything that you will communicate to your prospects. Get as many positive reviews and testimonials that will convince people to convert on your website. Here is an example from Criminally Prolific, where the site uses video testimonials as well as quotes. Once you have developed your website to be a conversion machine, you will be able to acquire an endless flow of qualified leads that will allow your web business to thrive. 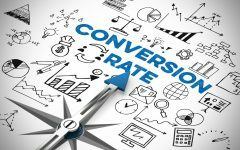 Start implementing the recommendations that have been provided and in the next 90 days, we guarantee that your business will see a substantial change in conversions.